Squaw Valley is spread over six interlinked peaks offering 3,600 acres of beautifully varied ski terrain super-charged with Olympic pedigree. Located at the north end of pristine Lake Tahoe, the resort is packed full of funky features designed to enhance your ski holiday experience, such as the world’s first ski-in/ski-out Starbucks and a pool open in the spring at High Camp at the summit of the 110 person Aerial Tram. The resort has Californian charm in spades with a relaxed and laid back attitude, quirky appeal and some truly outstanding skiing. The snow at Squaw Valley is world renowned - overnight dumps of snow here can be staggering, and with more than 300+ days of annual sunshine, more often than not you'll be skiing the next day under an azure Californian sky. You ski both Squaw Valley and neighbouring Alpine Meadows on the same lift ticket, with a short complimentary bus ride between the two areas, giving you access to an enhanced area of 6,000 acres of skiable terrain, 16 bowls, 270 trails and 42 lifts. Everyone we know who's been on a ski holiday to Squaw Valley has loved it. We feature the excellent Resort at Squaw Creek which is located in a ski-in/ski-out position at one end of the resort, with easy blue trail access to the main village. The Village at Squaw is the resort’s lively, energetic core built around the main ski base, with mostly condominium accommodation, all with quick access to six lifts directly from the village. Here you’ll find a mix of lively bars, some great shops, and a super range of restaurants serving everything from wings to wagu. We offer a full range of discounted Squaw Valley lift tickets, ski & snowboard rentals and snow school lessons and we always recommend you book early for our very best prices. At Squaw Valley, the mantra is 'if you can see it, then you can ski it' and the terrain is a mix of cruisy beginner and intermediate runs, more challenging pitches for strong intermediates and for the experts, there's no shortage of cornices, tree runs and steeps to play on. The scenery is unique here, with big mountain granite features and lightning-damaged trees competing with views of Lake Tahoe and the Sierra Nevada. 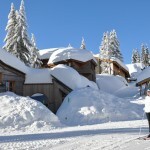 Beginners are certainly well-catered for at Squaw with a nice area set aside for first-timers. Once the basics are mastered then it’s time to ride the Aerial Tram to High Camp at 8,200ft where you’ll discover a whole section of the mountain dedicated to easy learning terrain, with wall-to-wall groomers and widely space trees, all with spectacular lake views. Intermediates should head for Shirley Lake for a choice of wide-open tree-lined cruisers, before testing themselves on the open-face of Siberia Bowl, or checking out the view from the top of Emigrant. Experts should head up the Headwall for a mix of big open bowls, long groomers, knee-trembling bumps and the steep drops of the legendary Palisades. Once conquered, it’s time to ramp it up a notch and head for KT22, known as ‘The Mothership’ - a zone with 2,000ft vertical of steeps, hero chutes, cliffs and moguls big enough to make you take a lesson. If you’ve tamed that, then finish your day with some hike-to terrain on Granite Chief – ski movie terrain with a well-earned reputation for Squawsomeness! Finish your day with a long shred down to the village ski base for après nachos and beer at Bar One, or cruise over and finish your day with a ski-in/ski-out beer on the deck at the Resort at Squaw Creek. Ski Independence offer a choice of airlines flying direct from London into San Francisco, or indirect into Reno and we provide complete flexibility to choose the day of departure, holiday duration, choice of airline and cabin type. We have the freedom to build you the perfect holiday itinerary around the best flight options that suit you, and not around a product we’re committed to sell. All of our holidays to Squaw Valley include a self-drive vehicle from San Francisco. We package our holidays with 'Gold' option car rental which includes all the mandatory taxes & fees, extra driver fees and fuel. We can also offer vehicles with SatNav. We can also offer private transfers from San Francisco and Reno airports.